In the second year of a partnership between the Smart Card Alliance and SourceMedia, the theme of CTST is enabling secure identity and payments in a mobile world. CTST: The Americas 2009 will take place May 4 – 7 at the Hilton New Orleans Riverside. The conference sessions are broken down into five tracks: identity and security, payments and applications, mobile and NFC, emerging technologies, Latin America and health care. “We’ve pulled together multiple tracks to address the different vertical markets that have the most activity in the North American and Latin American markets,” says Randy Vanderhoof, executive director of the Smart Card Alliance. The conference kicks off Monday, May 4 with pre-conference workshops covering some of the basics of smart card payments and mobile payments. 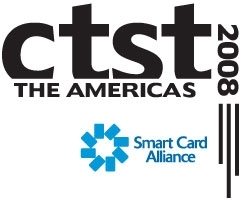 That same evening the Smart Card Alliance hosts a reception where it will announce its annual Outstanding Smart Card Achievement Awards. On Tuesday, May 5, the exhibit hall opens and other sessions begin. The conference is similar to last year with each morning starting with a roundtable discussion on various topics affecting the industry, Vanderhoof says. Tuesday will start with a payments industry roundtable, Wednesday will focus on identity and security and Thursday will wrap-up with a discussion on mobile technologies. The first day session focusing on payments will look at how the industry has changed in the past year with more bank consolidation, Vanderhoof says. “We need to have a fresh look because we have a contracting marketplace and we have institutions looking at risk management in a different way,” he says. The final roundtable will look at mobile technology where executives from that market will talk about the opportunities and challenges ahead for mobile payments, Vanderhoof says. The panel will have representatives from the operators and technology providers. After the morning roundtables attendees will break off into one of the five tracks. Identity and security, payments and mobile are similar to sessions in years past, but there have been some additions, Vanderhoof says. A three-day track on emerging technologies has expanded from one day the previous year. “We felt like we needed to add time in the agenda to cover the breadth of the technology innovation,” he says. Health care is also going to be a focus of the conference this year, Vanderhoof says. CTST had a half–day track on the topic last year but will now devote an entire day to it. Vanderhoof says the sessions have a mix of speakers from the U.S., Asia, Latin America and Europe. “We feel that we can learn a lot from what has been happening outside the U.S. and likewise others can gain a greater understanding from what’s in the U.S.,” he says.